The Eppendorf M4 Repeater is the 2013 reddot design award winner. It performs long series of pipetting easier and faster, dispensing liquid up to 100 times without refilling the tip. What does that mean for you? That means you don’t have to stand there and constantly have to be switching syringes. By having the ability to dispense 100 times in one combitip, you’ll not only save yourself time but you’ll be exposed to the pure efficiency that an Eppendorf M4 Repeater gives you. Volume dial. Easy to reach and adjust using your thumb as well as you’re able to choose from 20 different volume settings. RFID chip. Able to track the Repeaters data due to the RFID chip embedded inside the repeater. Combitip sensor. Automatically recognizes the volume of the Combitip and displays it on screen. Motion sensor. Power saving mode that turns off the Repeater M4 when not in use and turns it back on with minimal movement. The Eppendorf M4 Repeater is easy-to-use and ideal for those working with filling 96-well plates, it will save you time and effort. Read more about the Eppendorf M4 Repeater here. The Eppendorf Reference 2 follows the legacy of many other Eppendorf pipettes, it’s user-friendly and completely durable. The Eppendorf Reference 2 can be operated with a single button, meaning the aspiration, blow-out, and ejection of pipette tip can be achieved with a single operation. 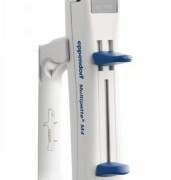 Eppendorf TrackIt. Embedded RFID chip gathers all information pertaining to the pipette including the serial number, Certificate of Conformity and article number, among other details. Multichannel version. Available in 8 and 12 channel versions; able to remove single cones. Spring loaded tip cone. Spring loaded tip cones allow for low effort during operation and ejection of the pipette tip. The Eppendorf Reference 2 is a highly precise and accurate instrument that provides reliable pipette results and reduces your change of repetitive stress injuries (RSI). Read more about the Eppendorf Reference 2 here. 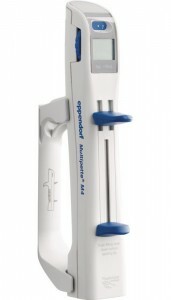 The Eppendorf Research plus multichannel pipette is another reddot design winner (2009), known for its comfortable design, flexibility, and durability. Volume dial. Volume adjustment only requires a few turns to reach the volume you desire. Ejector force. Low operating force that minimizes your risk of injuries during prolonged pipetting sessions. Eppendorf PerfectPiston. Lightweight piston made of Forton®, an organic polymer. The Eppendorf Research plus multichannel pipette is resistant to thermal, chemical, and mechanical stresses. With a very low operating force and a spring loaded tip cone, it promotes a more comfortable use and tighter pipette tip fit. Read more about the Eppendorf Research plus Multichannel pipette here. To learn more about these Eppendorf pipettes or the full line that Pipette.com carries, visit www.Pipette.com/EppendorfPipettes.